No more excuses. | Be Kind. We're all in this together. 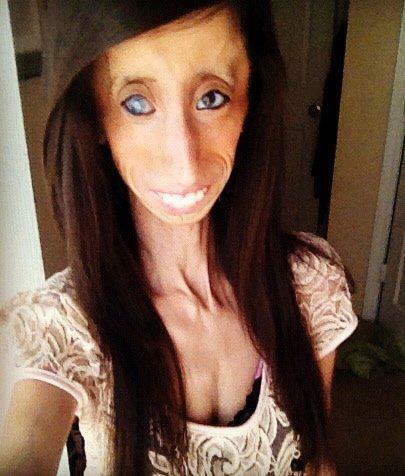 When she was in high school, Lizzie Velasquez was dubbed “The World’s Ugliest Woman” in an 8-second-long YouTube video. Born with a medical condition so rare that just two other people in the world are thought to have it, Velasquez has no adipose tissue and cannot create muscle, store energy, or gain weight. She has zero percent body fat and weighs just 60 pounds. Instead, she has thrived. Her internal organs, brain, and bones developed normally, though her body is tiny. Since she has no fatty tissue in which to store nutrients, she has to eat every 15 to 20 minutes to have enough energy to get through the day. One brown eye started clouding over when she was 4 years old, and now she’s blind in that eye and has only limited sight in the other. Lizzie is my hero. Published author, motivational speaker, over 200 workshops, an angel. What’s your excuse? Neither do I. Don’t wait for the right time, more money, more study. All we have is the present moment. Thank you Lizzie, you star. Shine on. This entry was posted in Self-empowerment, Spiritual and tagged bullying, Consciousness, cyber-bullying, human rights, inspirational, self-empowerment, social media. Bookmark the permalink.